Drama! Comedy! Tragedy! For the renowned Southern playwright called Snagglepuss, these are the ingredients that have made him a star of the New York stage and the glittering world that surrounds it. But the year is 1953, and behind the bright lights, darkness is brewing. Snagglepuss is gay...and his enemies are out to destroy him for it. As Snagglepuss prepares for his next hit play, there's already a target on his back. The Red Scare is in full effect, and the House Un-American Activities Committee is hunting down every last subversive in show business. So far, Snagglepuss has stayed out of their spotlight. One by one, his best friends are being blackballed, from legends like Lillian Hellman and Dorothy Parker to his fellow Southern gentleman Huckleberry Hound. Can Snagglepuss' reputation survive the rampage of the right wing long enough for him to stage his next masterpiece? One thing's for sure: the show must go on! 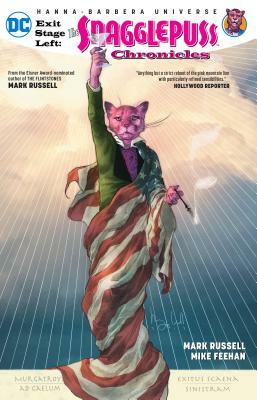 Hot off his surprise-hit reimagining of The Flintstones, writer Mark Russell joins artist Mike Feehan to unleash the fire and fury of his sharp-witted political satire in Exit Stage Left: The Snagglepuss Chronicles--a powerful look at what it means to be an American, no matter who or what you are. Collects Exit Stage Left: The Snagglepuss Chronicles #1-6, plus a Snagglepuss story from Suicide Squad/Banana Splits Special #1.